So this morning, I hopped on a train and headed to Salzburg. It’s only about an hour and a half journey and although I thought I might doze, the scenery kept me awake. Now I know why Julie Andrews did nothing but sing when she was here! 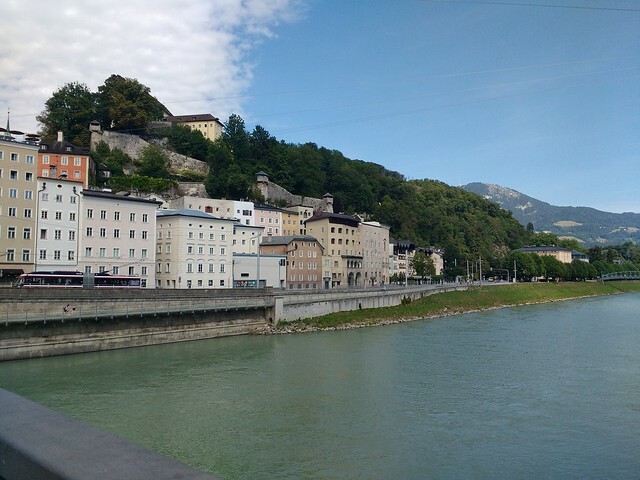 And when the train turned the bend and I saw Salzburg for the first time, I caught my breath. It was so lovely! Just this very Bavarian little town sitting in the middle of the Alps, this green river running through it. Being lazy (actually it was a hot day and I didn’t feel like walking the 20 minutes it took to get to my hotel), I took a taxi to my air conditioned hotel, which today, has been a god send. I’m sure going to miss it when I head back to Munich, because for some odd reason, last night, the room started out cool, but was warmer when I woke up. I had the window open. I had the fan on. I’m not sure how that happened. Something tells me I’m going to be hot at nights the next few days because the weather is only warming up. I hate summer. And I usually come to Europe this time of year so that I can wear sweaters and scarves. But oh, no, global warming is, apparently, a very real thing, and Europe got hit hard this year. I digress, though. Because Salzburg is really nice. I checked into the hotel and went out to grab a bite to eat. I ended up with spinach and parmesan dumplings (which was on the “light” menu, so I think maybe that word doesn’t mean what I think it means) and had a lovely glass of Austrian sparkling rose. I sat in the shade and enjoyed a breeze before hitting the town. 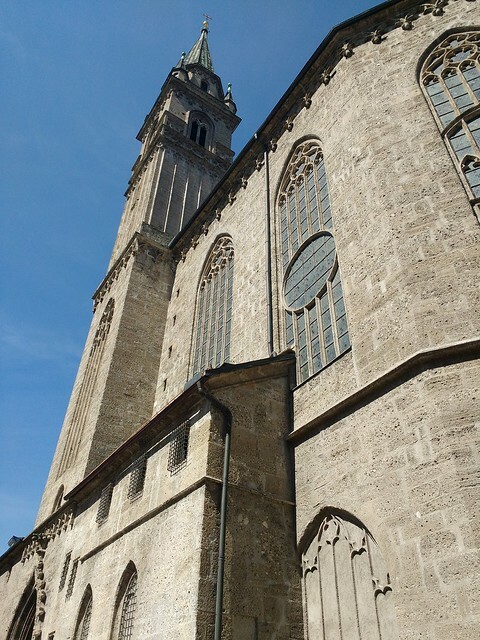 I did hit the town and meandered around until I found the Salzburg Cathedral. Being a church buff, I obviously had to check it out. A guy named Wolfgang Amadeus Mozart was baptized here. 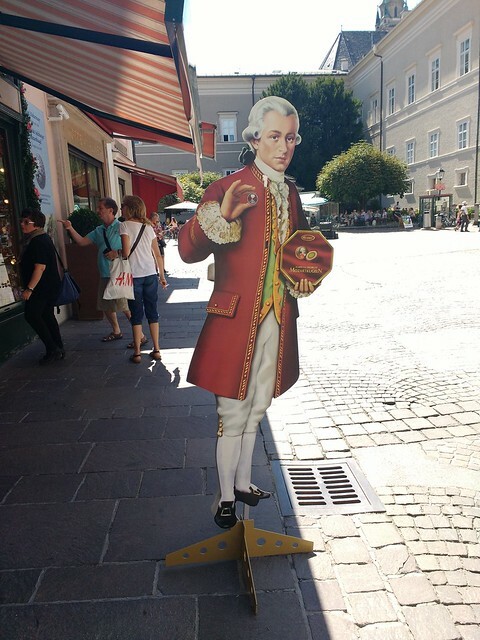 Oh, yeah, we’re in Mozart territory now. He even sells chocolates. Then I went outside, and after about 5 minutes, I was sweating and red and miserable. I made the mistake of wearing jeans in this weather. But in my defense, I don’t go out in summer for long periods of time. On my way back to the hotel to cool off, I popped into H&M and bought two tank tops and a short skirt. I went back to the hotel and changed into my new summer clothes and almost didn’t go back outside, but I did, and I realized that jeans in hot weather is just a bad idea. I was much more comfortable and discovered that the long street in Salzburg with all the great shops is also very well shaded and has a nice breeze. So I shopped. This could be a dangerous precedent. I bought a few souvenirs for myself, including chocolate filled with booze (something you can’t get in the U.S.) and a bottle of Austrian Riesling that was recommended by the girl at the wine store. I was surprised at how reasonably priced the wine was, too: only $17 euros, which comes out to about $19 American dollars. Yay for a good exchange rate! I also bought a few souvenirs for people back home and plan on doing a little more shopping tomorrow. I sorta’ kinda’ want a cuckoo clock, but it would be hard to pack (although I’m sure they put it in foam or something). I’m also concerned about the cats. And about me wanting to punch the cuckoo after about the third time it chimed on the hour. So then again, maybe not. By the time I got back, I needed to shower and get changed for the opera. I managed to score a ticket to Iphigenie en Tauride during the Salzburg festival, with Cecilia Bartoli as the lead. This is a very big deal as it’s my first real world class opera production. So I got dressed up, put on my best bling and headed to dinner at the restaurant across the road from the hotel. Dinner was ghoulash, which was also served with a giant dumpling. I’m getting that this is a Bavarian trend. I also had an almond chocolate mousse for dessert and a glass of Riesling. 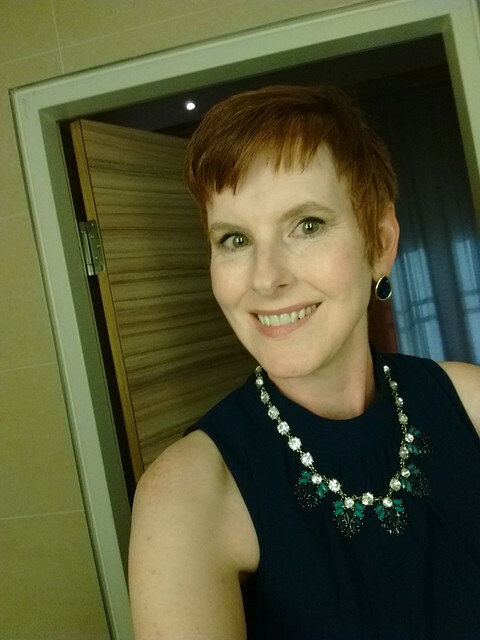 Before I left, the waiter inquired if I was going to the opera (as I was dressed up) and he warned me that the opera was four hours and 20 minutes long. That disturbed me. I didn’t realize at the time that he was joking. Haha. Funny you, Austrian man. You got me. Because I was wearing heels, I took a taxi to the opera house, Haus Fur Mozart. And when I got there, it was hot inside the building. I don’t think it’s air conditioned, or if it is, it’s not very well air conditioned. Europeans are so anti air conditioning that a million dollar modern opera house is still freaking hot. And I thought I would die after four hours. Fortunately, the opera was a lot shorter than that: two hours and 30 minutes with intermission. And although I got warm, the production itself was so good that I never noticed (although I kicked my shoes off after the first act). I cried, I gasped, I cheered. It was a very emotional experience for me. Afterwards, I left the opera house (practically limping in high heels, something I never wear, but I LOOKED GOOD) and sat down at a nearby fountain. I took those darn shoes off and I walked all the way back to the hotel, a 10-minute walk. I got a few stares from the rest of the opera-going crowd, but I also got a few nods like people approved of my choice. Me? I don’t care. I’m a freaking TOURIST. I got back to the hotel and thought about putting on some flats with the dress and grab a drink, but I ended up in pajamas with no shoes, drinking a sparling water and eating some boozy chocolate. Not a bad ending to the evening. Tomorrow, I plan on doing some sightseeing in my nice cool outfit. I really wished I’d brought the skimpy summer dress I left in Munich, but I’ll need that there because there’s heat warnings for the next two days. I feel like Europe has betrayed me, what with all this heat. But hey, the first time I went to London, it snowed. In October, which is rare. But, fortunately, H&M saved me there, too, because I purchased gloves and a winter scarf to keep warm that year. H&M is always a good bet for inexpensive clothing items when traveling abroad.